She is one girl whom every guy would want to take home to his mom and bindaas say ‘Maa… yeh apki bahu hai”. We are indeed talking about the one and only Genelia D’Souza, the Aditi from Jaane Tu……, who looks like never before in the latest edition of Elle. One has to give it to the fotog for shooting her so differently! Well, Genelia does open up in this interview like she always has and shows her ‘good’ side. She goes on record to say that, “For us, the film industry was this big bad world- a place where people who didn’t study landed up”. Let’s give it to this PYT for ‘trying-to-be-diplomatic’ when it comes to her love life. Even though she denies any confirmation about information on her love life, she does say that she is a ‘fantastic girlfriend’ who devotes herself to her relationship. 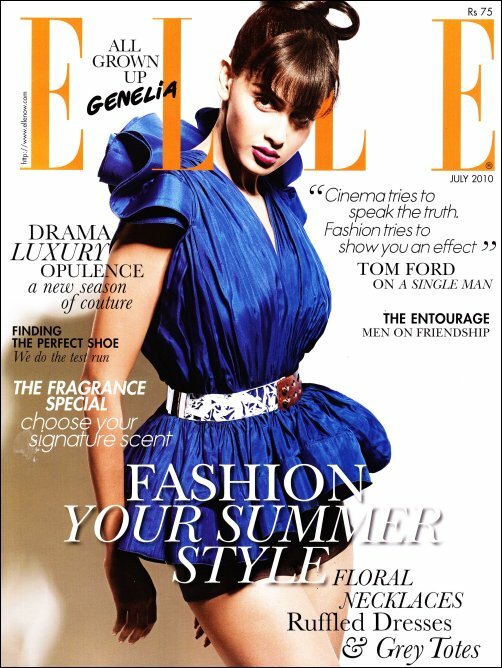 All in all, Genelia is the way to go… to be ‘Elle-gant’ this season! Filmmaker duo Indra Kumar and Ashok Thackeria have decided to open a huge studio in Baroda, Gujarat. A source said, “The studio will have many floors for shooting, hotels for the stars to stay in, restaurants, an amusement park (and we thought filmmaking was serious business) and a helipad. The intention is to bring the film industry to Gujarat. Chief Minister Narendra Modi has already sanctioned the project. The studio will be named Maruti International, which is also Indra Kumar’s and Ashok Thackeria’s banner.” Indra Kumar remained unavailable for comment. The first thing that one notices about Pratik is that he is a mirror image of his gorgeous mother Smita Patil. After a few seconds of talking to him you realise one more thing- he is very soft-spoken. Once you get done with several rounds of could-you-please-speak-loudly requests, Pratik is just like most 23-year-olds- chilled out, unpretentious and refreshingly honest. His life has been anything but uneventful. He got used to the constant media attention ever since he was in his teens and people noticed him all the more because he is Raj Babbar and Smita’s son. He says that he gave his first autograph when he wasn’t even a model, leave alone an actor. Since then, Pratik has been in several situations when he has had to pinch himself to believe that his erratic shooting schedules, strenuous gym workouts, health conscious diet and being linked to several girls are an inherent part of being an actor. Talking about his forthcoming films, he says, “Dhobi Ghat is an art house, sentimental film with a beautiful background score. My Friend Pinto (produced by Sanjay Leela Bhansali) is more commercial.” He also admitted that talks are on with Goldie Behl for his next film. Commenting on what he has learnt from the film industry, Pratik says, “My first lesson as an actor was to not take things for granted and that one should never overestimate or underestimate oneself. Respect other people and most importantly, listen and observe. I also learn by watching actors on screen and my first thought is ‘How can I make that role more watchable?’.” He then breaks into an impish grin on realising that he just made a politically incorrect statement in Bollywood. Told you, he is refreshingly honest. If you thought that Priyanka Chopra took your breath away with ‘shine-a-dozen’ performance in What’s Your Raashee? be ready for yet another breather (stopper) of a performance! This time round, it’s none other than the bong-shell Bipasha Basu, who will be sizzling like there’s no tomorrow in her forthcoming film Pankh. Bipasha has donned a whopping 9 different looks for the film, which is not the quintessential song and dance routine makeover. If you are wondering as to why the nine looks, then, wonder no further. It’s only because every look that has been designed for Bipasha reflects the mood of the male lead played by Maradonna. In the film, she is his imagination… his alter ego. Talking about her nine different avatars, Bipasha said that whenever Maradonna feels vulnerable, she has been given a soft look and whenever he is agitated or in self doubt, her looks was made to look harsh. The entire credit of the nine looks goes solely to the ultra creative team of designer Rocky S, director Sudipto Chattopadhyaya and the producer Sanjay Gupta, who were instrumental and involved in designing the right look to match the attitude of the character. Talking about the film, Sanjay Gupta says, “Pankh is a wild ride through the underbelly of the film industry. Bipasha plays an alter ego, a fantasy & we wanted her to look like the two divas – Sophia Loren & Liza Minelli from ‘Cabaret’. With so much going for one film, one better expect nothing less than fireworks from Pankh. A letter to HRD minister Kapil Sibal requested the inclusion of Aamir Khan and Yash Chopra as directors and Mukesh Bhatt and Boney Kapoor as producers. The HRD minister, though, has turned down the request which has upset members, and now, producers in the committee have decided to abstain themselves from the meet. There is a storm brewing in Bollywood. The HRD minister has unintentionally opened a can of worms. Even before the first meeting of the newly constituted body — which is to take place on February 28 — film producers have decided to walk out of the committee. But the drama gets even more interesting with other members of the filmmaking community, including directors, cinematographers and editors, and even the south Indian film industry raising objections over the composition of the committee and demanding adequate representation. The Indian Film and Television Directors’ Association (IFDA) too has written to various ministries, including the HRD, for keeping them in the dark about the committee. In the letter to the minister, IFDA members say they play an important part of the process of film-making and yet there is no attempt to involve them. The letter adds, “It will be a huge miscarriage of justice, and a perverse and corrupt act which does not take into account the point of view of the various stakeholders involved in the process of filmmaking. The Copyright Act is being amended after over 50 years. It is a very important moment in history. Meanwhile, the South Indian Film Chamber of Commerce is upset at being kept out. President C Kalyan, in his letter to Sibal, has demanded representation of two members. Mumbai: Actor Aamir Khan has withdrawn his resignation from the informal panel formed by the HRD ministry on amendments to the Copyright Act. Aamir had resigned following differences with lyricist Javed Akhtar. But later, a joint letter by members of the panel requested Sibal to intervene. The HRD minister then requested Aamir to reconsider his decision which he agreed to do. In their letter to Sibal, the panel members had pointed out that no one had questioned Aamir’s integrity. The letter was written by Akhtar, Vishal Bharadwaj, Vishal Dadlani, Prasoon Joshi, Anjum Rajabali, Saket Chaudhury and Ram Sampat. The actor reportedly had heated exchanges with Akhtar and others over the issue of royalties in a meeting between producers and writers on Sunday. The purpose behind the formation of the informal committee is to initiate a process of dialogue on the issue of objections raised by certain sections of film industry to the proposed amendment. The committee would evolve a formula under which the authors of musical, cinematographic and literary works will be entitled to royalty in case their works are used for commercial purposes, a benefit denied to them so far. Ash offered 7 crore for a film? Bollywood pay cheques have hit the ceiling and crossed dizzy heights. Last week, film industry pundits wah-wahed when news broke out that Kareena Kapoor had hit the Rs 7-crore mark. Today, that seems like small change before the Rs 10 crore offer that’s reportedly been made to Aishwarya Rai Bachchan by producer Bobby Pushkarna of the National Award winning film Page 3 fame. Bobby wants to sign Ash, who was last seen in 2008’s Jodha Akbar, for a film to be made on the lines of Jag Mundhra’s Provoked — that, incidentally, starred the Bachchan bahu and foreign actors. He’s been chasing the actress for three months and if Ash doesn’t agree, then Bobby won’t make the film. At the time of writing, Ash who was busy with Guzaarish, Action Replay and Robot, was going through the script. Kangna Ranaut doesn’t have the measurements to make you sit up and take notice of her. But if she were to make a clean breast of things, she would still have a lot to say. The 22-year-old from Manali made several mistakes (personal and professional) in her first year in Bollywood. But she’s used those very same mistakes as stepping stones on her journey to stardom. With multiple releases lined up in 2010 including Kites, Once Upon A Time in Mumbai, Tanu Weds Manu, Knockout, No Problem and The Actor, life is throwing a rainbow of roles for her. In a film industry that is plagued with piracy and other forms of creative and financial vandalism, the downloading of Sudhir Mishra’s unreleased film Tera Kya Hoga Johnny nonetheless comes as a rude shock. The director, shooting his latest film in the freezing winter of Delhi, took time off to speak exclusively to Bollywood Hungama. Trying hard to keep the annoyance and anger out of his voice, Sudhir refuses to play the blame game with the film’s co-producer Tutu Sharma. Tera Kya Hoga Johnny is an episodic story of a street -child name Johnny. Mishra got an actual boy from the streets of Kolkata to play the lead and even unofficially adopted the boy who now lives with the director. Neil Nitin Mukesh who features in one of the episodes was blamed for the film’s two-year delay in release. It was said that Neil didn’t want the film to release because of his minuscule role. pawan: as usal i wl be wait for this movie.